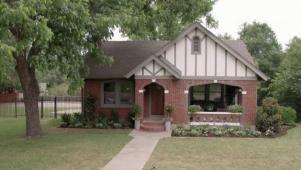 Joanna Gaines and her design team transform an antiquated house into a Tudor-style dream home for Joey and Courtney Scrivano. In addition to restoring the home's original 1920s charm, the Scrivanos want to see a blend of their personal styles, which are both traditional and modern. With a sharp eye for balance and detail, Joanna incorporates both styles and blends them with the historic characteristics of the Tudor-style home. Plus, she reveals the illustrious guest bathroom, a wallpaper-covered beauty that was not featured in the original episode.